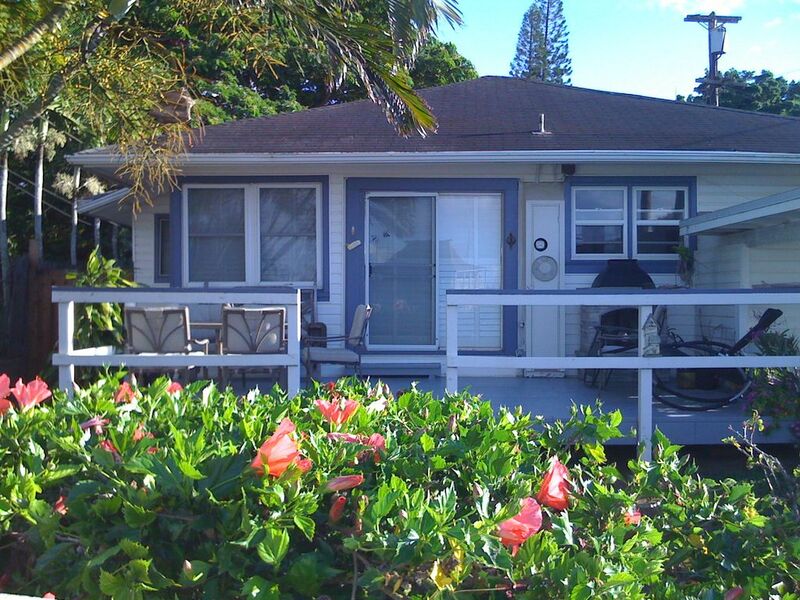 Our house is located in historic Haleiwa Town complete with its charming shops, restaurants and art galleries. Nowhere else on Oahu will you find quaint shops and cafes housed in plantation-era buildings. The ocean is right at your doorstep and everything you need for the perfect vacation in walking distance. Walk to the beach, shops, dining and the boat harbor – where you can go on boat charters, fishing trips, whale watching or rent jet skis. You are steps away from the world famous Alii Beach. Surf, swim, shell collecting, walk on the beach, something for whole family. Our two-bedroom house has a complete full size kitchen with all the appliances, microwave, oven/stove, queen bed in master bedroom and two twin beds in the second bedroom. There is also one and a half baths. We have basic cable and high speed internet connection. All you need to do is bring your laptop! Though the trade winds and the ocean breeze typically keep the house cool, we do have ceiling fans throughout the house and AC units in the bedrooms for your comfort. The house is perfect for small families or groups of 4 people. Come relax, enjoy and experience the North Shore at its finest! Call or email for weekly and monthly specials!! We provide initial supplies to get you started and then you are on your own. The rental comes with 2 rolls of toilet paper/bathroom, roll of paper towels, sponge and dishwasher lquid, dish liquid and garbage bags. Each bathroom also has liquid soap.